The shoulder, consists of thick cartilage that surrounds the rim of the shoulder socket. The shoulder is similar to a ball inserted into a socket joint. Stability is improved by the use of the labrum by increasing depth of the shoulder socket. There is an area where the tendons located on the bicep and are attached to the top, this is called the labrum. At this site, also located in this spot are secure attachments of the shoulder joint capsule and ligaments. 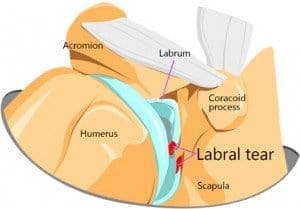 The Superior Labrum Anterior to Posterior, or SLAP, lesion injury is the most common one affecting the labrum. These injuries involve the movements of the biceps tendon attached to the labrum, as well. SLAP lesions are caused by various activities, such as stretching the arm out too far, carrying a heavy load on the shoulders or falling on top of an arm. These actions may cause a severe tear forms in the labrum and biceps tendon area. Non-SLAP lesions form when the shoulder gets fully or partially dislocated. People may feel grinding whenever they move their arms or hear clicks and pops. It takes an MRI scan and a series of clinical tests to make a diagnosis. A common treatment for this injury is arthroscopic surgery, which involves removing the tear and damaged tissue. After surgery, patients are expected to follow a regimen that allows them to regain their joint strength and balance. The average exercise routine consists of simple to elaborate exercises. Over time, they take on tasks that are more challenging in the gym room and regular life. After a while, injured people decide if they can return to playing sports. This decision is determined by the number of weeks or months that it takes for the shoulder to heal. In their exercises, patients should gradually increase the loads placed on their shoulders. That way, they can handle the pressures that come with playing intensive sports again. After surgery, patients are expected to undergo physiotherapy consisting of different exercises and massages that soothe and strengthen the shoulder. The point is to expand control of the muscles around the shoulder blade and rotator cuff. Also, they improve the strength and balance of the humerus found within the glenoid. Overall, they improve the entire use of the shoulder as they take on everyday activities. Everyone has a different way of regaining strength, balance and mobility after a serious injury. Fortunately, there are surgeons, physical therapists and nutritionists with the right plans to get people back on their feet. After days of vital research and weeks of careful therapy, it is possible to regain strength in an injured shoulder and return to important physical activities.